According to Spectrem’s wealth segmentation series study on investors and their specific investment decisions – Asset Allocation, Portfolios and Primary Providers – more than 10 percent of all investors use a robo-advisor to some extent. 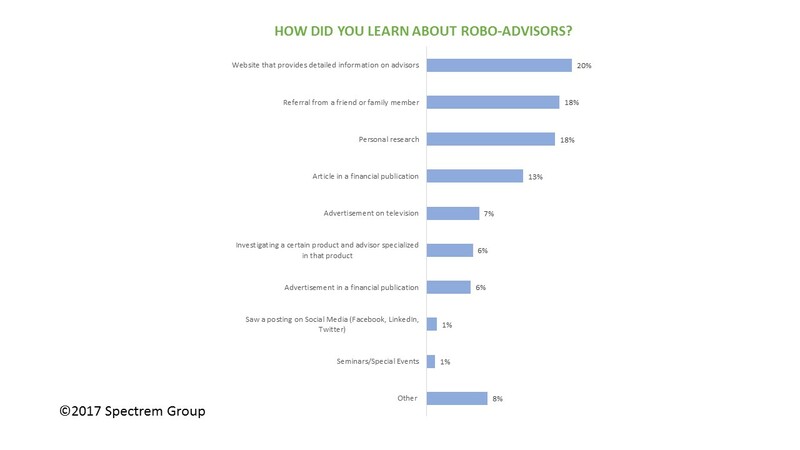 In light of this growing percentage of investors going robo, Spectrem surveyed investors who use such advisors and asked them how they found out about robo-advisors in the first place. At least that is what the research is telling us. In the Spectrem study Wealthy Investors and their Perceptions of Robo-Advisors, 20 percent of investors found out about the automated services by visiting a website that provided information on advisor services. That means those investors looked into advisor services and chose a robo-advisor because it was the best fit for their needs. The study explains in detail how investors made that choice once they were aware of their options. Similar percentages (18 percent each) found out about robo-advisors from a referral from a friend or family member, and through other forms of personal research. The robo-advisors therefore are getting business through referrals, which formerly was the bailiwick of human advisors who did their job so well, investors wanted others to enjoy the same level of service. Now, investors are sharing their information about robo-advisors with people they care about. Robo-advisors apparently are doing the job well enough that users want others to enjoy the same level of service. Advertising plays a role, and companies who only provide technology-based services do a great deal of advertising in financial publications (13 percent of investors) or on television (7 percent of investors). It would be beneficial for advisors and financial firms to look at TV and print advertising to see what buzz words these services are using to attract investors. There must be a hook that is bringing in the two audiences they are most closely targeting: first-time investors or investors who were not satisfied with the service they received from a human advisor. It is telling that some advisors are getting on board with the robo-advisor services. According to the Spectrem study, 46 percent of robo-users were encouraged by their human advisor to being using the automated system for some of their assets. Simply put, investors are going to find the robo-services, and since they have such a wide choice of options, they are likely to look around for the service that offers the most options and the lower rates. Advisors aligned with companies that offer robo-advisors must determine the best way to sell the automated service while letting investors know that there is a human advisor available as well.